A concentration camp existed within the municipality of Ladelund from November 1 to December 16, 1944. The SS had 2,000 prisoners from twelve different countries dig anti-tank trenches between Humptrup and Ladelund. The trenches were intended to stop a feared Allied invasion from the north. No-one in the village could avoid seeing the tormented and starving people who were forced to work there. Three hundred prisoners died within six weeks and were buried in the town cemetery. The graves serve as the starting point and focus of the memorial. The 2,000 concentration camp prisoners arrived in Ladelund, a municipality that had »joyously welcomed the desired national shift« in January 1933, according to the Ladelund church chronicle of 1933. In Ladelund, 84.6 % of the population had voted for the NSDAP in the Reichstag election of November 1932. The SS housed the concentration camp prisoners in a barracks camp that had been erected by the Reich Labor Service (RAD) in summer 1938 for 200 »workmen« of the RAD-Ladelund Division 1/75. 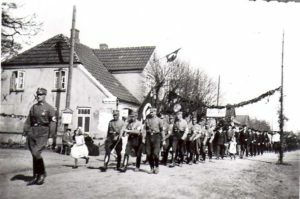 The deployment of »workmen« in Ladelund ended with the start of the war in September 1939. The Nazi state now needed these men in the military. 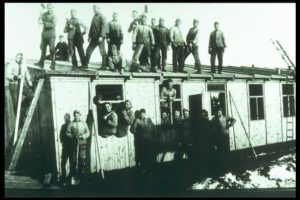 The photograph shows an RAD camp barrack being assembled in Ladelund. The first prisoners were brought to Ladelund between November 1-2, 1944 to extend the »line of defense« along the German-Danish border. They were transported by train to Achtrup. The 2,000 weakened men had to walk eight kilometers from the station to Ladelund. After the war, Bob Smit, a former prisoner, reported that 2,160 prisoners were counted at the first roll call in Ladelund. They came from twelve different countries. The largest group came from the Netherlands and included many of the men who had been arrested in Putten. The other prisoners had been deported from Poland, the Soviet Union, Italy, France, Belgium, Germany, Greece, Yugoslavia, Latvia, former Czechoslovakia and Hungary. There were only a few Jews in the Ladelund concentration camp. 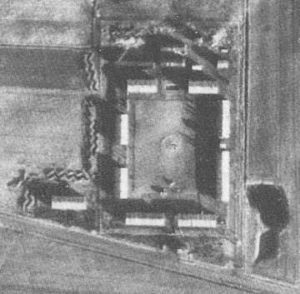 Aerial photograph of the Ladelund camp taken by the British Royal Air Force on November 27, 1944. This is the only known photograph taken during the camp’s existence. The roll call ground was surrounded by eight prisoner barracks. The camp’s entrance faced the street (in foreground). The sanitary facilities are visible at the top of the photo. The shrapnel protection ditches can also be discerned to the left. More than 2,000 prisoners were crowded into the Ladelund subcamp by the SS from November 1 to December 16, 1944. The camp was only built to hold 200 people and thus, despite the harsh weather conditions in Northern Friesland in late fall, most of men had to sleep on the bare floor. The prisoners were quickly debilitated as a consequence of overcrowding, catastrophic sanitary conditions, totally inadequate food and medical provisions, lack of warm clothing and brutal treatment by the guards. Three hundred people died in the Ladelund camp during the six weeks of its existence. 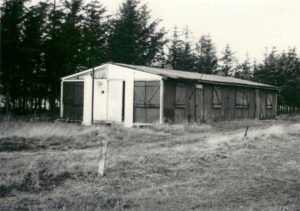 With the end of World War II evacuees, refugees and displaced persons were housed in the barracks of the former concentration camp. The last refugee families left the camp in 1959 and the last barrack was torn down in 1970. Since then the area has been used for farming. In 1985 the Ladelund Church parish leased a small section of the grounds and established a memorial site there. 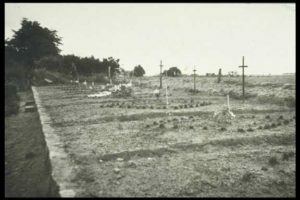 After the war, Pastor Meyer strove to create and maintain a dignified gravesite. The graves were the beginning and center of the Ladelund memorial. October 24, 1950, the day 130 relatives of the deceased prisoners from Putten in the Netherlands first visited the graves, marks the founding date.